Thursday August 14 Bright & clear this morn, but clouded up last of P.M. & had quite a shower, brightened up before dark so I went over to Rose's for first time today. Lena "washing" in A.M. so I had few chores extra. We let our dinner hour go till time for 1,30 - train, thinking perhaps Ellery might return, but we had our dinner in peace & quiet. Mrs Howe in few minutes in A.M. I kept busy tho' not doing much. 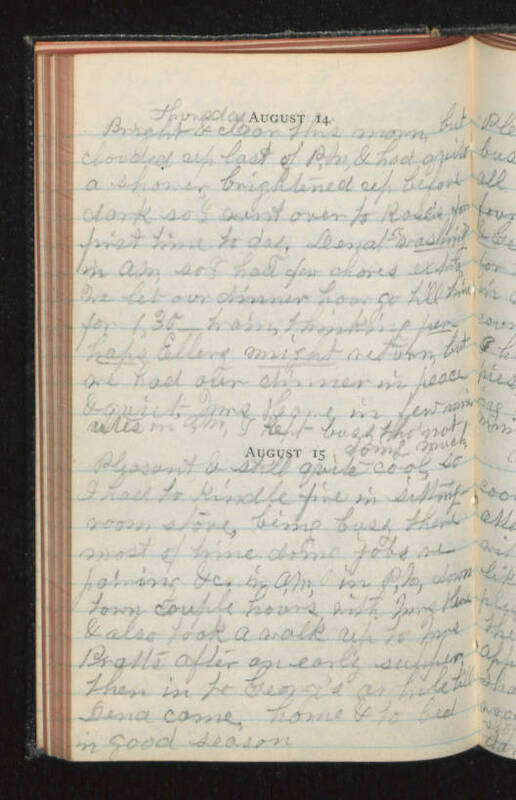 August 15 Pleasant & still quite cool, so I had to kindle fire in sitting room stove, being busy there most of time doing jobs repairing &c. in A.M., in P.M. down town couple hours with Mrs Howe & also took a walk up to Mrs Pratts after an early supper. Then in to George's awhile till Lena came home & to bed in good season.